It’s a foggy San Francisco morning and I for one can use a little sunshine today. Perhaps you can too. Here are a few more pictures from our recent trip to Hawaii. It’s such an amazing place — so much gorgeous color! The air smells incredible, the warm breeze… ahh… take me back! 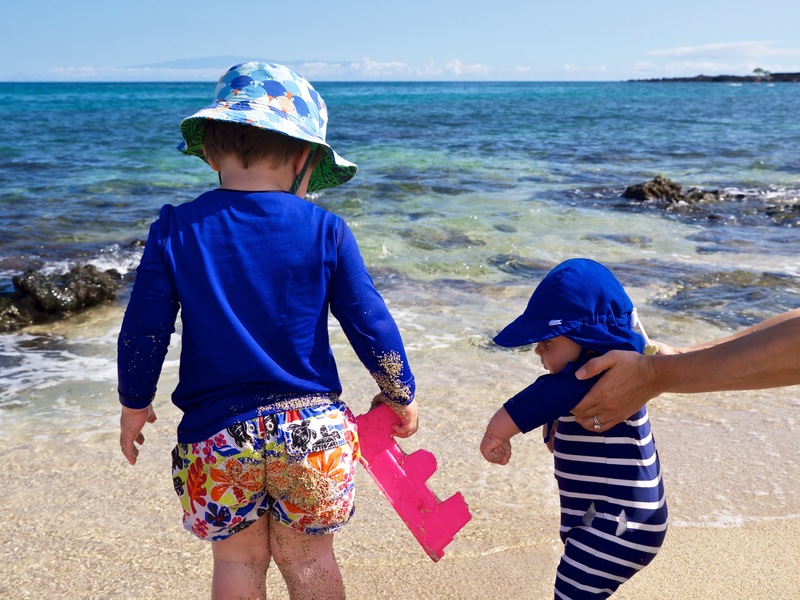 Traveling with kids is never easy, even in paradise. We had the grandparents with us and we were all pretty busy taking care of the two boys. But when childcare means swimming in the ocean and the kiddie meal happens outside at sunset, you really can’t complain. I’ve skimped a little on outfit credits as it’s mostly older things but leave a comment if you have any questions! In beach related style — check out this slideshow on Refinery 29. It’s real women on the beach and they got some great shots. The women are a) wearing cool, inspirational outfits, b) from places you and i shop and c) look like healthy gorgeous normal women. No super models in sight. I love the mix and match suits. Click on the images below for a pop up tropical slideshow. My boys playing in the sand. I love finding vintage Hawaii clothes on eBay. I search for “aloha” in their sizes. This tank was 99 cents! Relaxing in our rash guards. Brothers chilling. Tees by Carters. I love an agua fresca on a hot day. Blend or juice watermelon with lime – it’s that simple. If you have a juicer, try throwing in a few slices of whole lime. The extra zing is awesome. Taking my boy for his nap. He took crazy long naps after all the time in the water. Yea, the weather has been funky lately. Great pics!